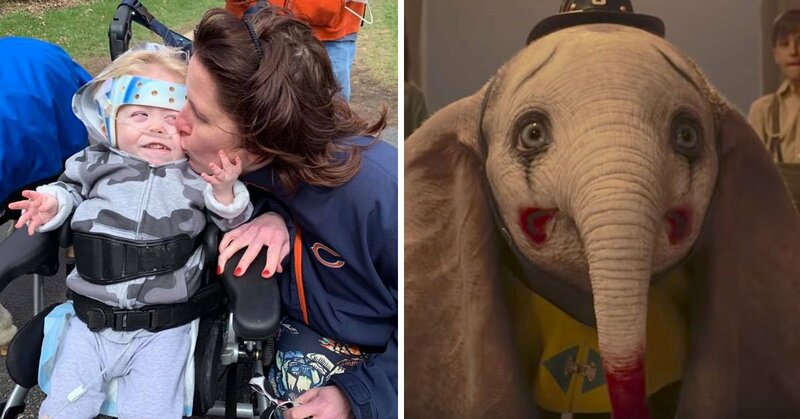 This Adorable Little Boy With Special Needs Was Kicked Out Of Dumbo Because He Was "Laughing Too Much"
I’m not sure if you’re aware (and if you aren’t aware of it then where have you freakin’ BEEN!?) but if there was ever a year for Disney movie releases – it’s this one. Aladdin, The Lion King, Toy Story 4, Maleficent 2, Frozen 2, Jungle Cruise… and of course, Dumbo, just to name a few. It’s basically the dream year for parents to take their children to the cinema, especially if they want to start introducing them to the wonderful world of Disney. Now, as you may or may not know (but even if you don’t have kids common sense would probably tell you this) taking small children to the movies (or, y’know, literally anywhere) can be somewhat of a challenge. And when you’re the parent of a special needs child? Well, things can get even trickier. And no one knows this better than Jennifer Daly, who recently had to face this harsh reality… not only that, but she had to face it during a what should have been an enjoyable showing of Disney’s latest release, Dumbo. Jennifer Daly’s 3 1/2-year-old son, Jonathan, has a very rare form of dwarfism that causes other various medical conditions and requires him to use a wheelchair. And although he’s still unable to talk, little Jonathan can make noises when he wants to express himself — especially including laughter when he finds something hilariously funny. Sweet, right? Well, apparently, not everybody thinks so. Because apparently, it was his exuberant laughter last week during a showing of Disney’s Dumbo which led to an incredibly upsetting confrontation that has left Jonathan’s poor mom shaken. The “incident” happened last Friday night, when Daly took adorable little Jonathan and her other young son to an AMC movie theater over at Lake in the Hills, Illinois, according to WGNTV. About an hour into the showing, Jonathan started laughing and making noises, because, let’s be honest, he’s a young kid watching a Disney movie… obviously he’s going to enjoy it. Super harmless, you would think. However, just 10 minutes later, a movie theater employee came over to inform them that they had, in fact, received a noise complaint. Now, of course, there are plenty of fairly acceptable ways to go about issuing this kind of message to a parent… especially in these particular circumstances. Like, y’know, the employee could have politely let the mother know that they’d received a complaint, and then perhaps asked if there was anything she could do in order to keep the noise level down. Or… they could even have merely just mentioned that a complaint had come in, to just make her aware of the situation.